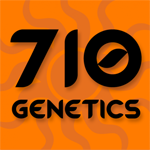 710 Genetics - Berry OG Kush. Free US delivery. This Indica dominant hybrid was created by crossing Blueberry with OG Kush. It has a berry aroma, mild flavour and is both sweet and fruity, leaving a lasting impression. Berry OG Kush is a strain with very dense buds and a big resin producer, which finishes in 8-9 weeks indoors and delivers a uniquely dark colour, strong structure with average yields and rock-hard buds. Berry OG Kush gives a euphoric head buzz that weighs heavily on your eyes, whilst relieving you of stress.